You are Soccer Kid. He is a kid who is pissed because some evil dude is stealing all the soccer trophies. So he goes out to try and recapture these trophies and watch the world come soccer game. 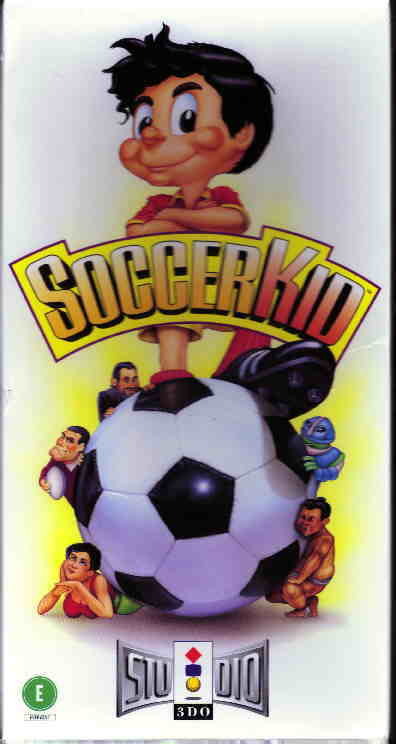 Soccer Kid is a neat little side scroller where your a kid who kicks a soccer ball at enemies(what a concept). There are many ways to kick the soccer ball, bicycles, headers, etc. Besides just knocking out enemies with your trusty soccer ball, there are also 11 soccer cards to collect in each stage. There are 2 stages per world and on each you collect either 5 or 6 cards. If you collect all the cards, after some worlds you get to go to sort of a bonus stage where if you collect everything then you get a piece of the world cup trophy. After you beat a few of the worlds there is a boss that awaits you at the end but he usually isn't too terribly difficult. I haven't beaten the game yet but I just got done trying a couple minutes ago. I have beaten 2 of the bosses so far and am to the ship stage. The graphics are very cartoony(which is alright I guess) but they are a little too cute. The FMV cartoon scenes are alright too. Some of the enemies I dont think should be portrayed as enemies. Like what's up with hitting bums and kids riding bikes with a soccer ball. Control is done fairly well but it is hard to hit flying enemies and enemies high up. It would be cool if there were different type of soccer ball power ups, such us a lock-on ball or a ball which acts like a grenade when you kick it. The one thing I dont get what you use it for is the slide button, I just cannot figure out why that is a command. I think the programmers just wanted to have all of the 3DO control pad's buttons represented. But still I guess the control's all right. KICKOFF! The begginning of each level is great and the background music is stupendous. When the kid kicks the soccer ball there is a sudden thump which gets annoying after a while also when you collect different things that sound does too but that's nothing major. Still the background music is great and that is pretty much the heart of the sounds department. Fun to play with lots of levels. I've seen many games that are sidescollers but this one just seems different to me. I don't know....it's awesome how you can jump on top of the ball and then be catapulted up, up and away! Still sidescrollers are fun to play if you are able to progress through without too much difficulty. This game sure has difficulty especially if you try to collect all of the little soccer cards. But the game is fun and isn't quite as unforgiving as some sidescrollers where you get hit once and die. This game you get three hits and later on in the game four(who knows maybe five later on! ).